Second Location: 8 am - 12pm Wed.
*SATURDAY APPOINTMENTS: may be available one Saturday a month. 8 am to 12 pm. Call for availability. "We look forward to participating in your health care! We treat patients with loyalty and respect through trust. We want to promote healthy feet and will strive to heal and protect your feet with the quality of care you deserve in a peaceful environment." -Dr. Rory Panepinto, D.P.M. 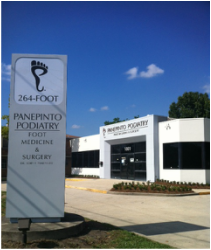 Panepinto Podiatry offers Family Foot and Ankle Care. Our practice is a full service general and surgical foot care practice. Dr. Panepinto has been in practice for over 14 years and performs surgical procedures weekly that range from simple to reconstructive foot surgery, including cosmetic foot surgery. He will bring this experience to customize care for each individual patient. See our Services tab to view the extensive treatment options from conservative Diabetic Foot and Wound Care, Heel pain, Ingrown Toenails, Fungus Toenails, Warts, Laser Toenail Therapy to Surgical Treatments to correct mild to severe Bunions and Hammertoes with the latest techniques. and when the Doctors themselves choose our care! "Dr. Panepinto is a gentle person and really caring. He is always respectful while explaining anything you ask him. He never shows stress and his bedside manner is calming. I would highly recommend him for any foot problems. I had a big toe joint replacement that went perfectly." -C.S. "First came to Dr. Panepinto, I believe, in '04. Had a problem with a foot and had gone to 3 docs in the Alexandria, LA area and it was always "next time you come in we are going to----". With Dr. Panepinto, It was "this time we are going to ----". And it wasn't just talk, his diagnosis and treatment worked almost immediately." -K.A. "Dr. Panepinto is a fabulous doctor. He took a lot of time listening to my problems. He was the third podiatrist I had seen in the last year and he was the only one that was able to correct my foot pain. Foot pain that I had been suffering with for over 25 years. He did an excellent job and I highly recommend him." -S.M. "Dr. Panepinto, just wantd to say that your office staff are great and you were great today. From my first phone call to my first visit to your office your staff and your professionalism, patience and practicality were GREAT! Thank you for your practice." -J. M.
We can be reached by phone, (504)264-FOOT (3668) for any questions/concerns and to schedule appointments. Have a general question and you would like to contact us by e-mail? Just click the Contact Us tab and provide your information, send us a message, and we will do our best to respond within 24 business hours. If you do not hear from please call us because there may be a technical error in the computer system or mistyped contact information.